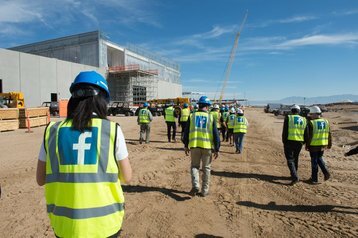 Facebook plans to spend $750 million over five years on a data center campus outside Atlanta, Georgia, its ninth in the United States. The site in Staton Springs, Newton County, will consist of two data centers totaling 970,000 square feet (90,000 sq m), which will be operational by 2020. Further investment at this location could reach nearly $2.5bn by 2029. The Newton Data Center will be powered by renewable energy thanks to a power purchase agreement with Walton Electric Membership Corporation - the consumer-owned utility that is planning to install hundreds of acres of solar panels in Georgia. On Tuesday, the Atlanta Business Chronicle reported that the governor moved the announcement forward by two weeks for reasons unknown. Georgia’s state government is in the midst of a spat with Delta Airlines, eliminating a proposed $50m tax incentive after Delta removed a promotional deal for National Rifle Association members following the latest tragic school shooting. The public conflict between the state and the private corporation has led to concerns over Georgia’s attitude towards businesses, and governor Deal was quick to highlight Facebook’s investment. Deal, who is not running for reelection due to term limits, has criticized the attempts to hurt Delta’s bottom line, an effort headed by Lt. Gov. Casey Cagle, the presumed frontrunner in the governorship race.